This post is the continuous of my previous Deski 3.1 to Webi 3.1 conversion. Instead of going through RCT converted reports (partially converted and Fully converted), I would be happy to provide more details on how we can achieve the Webi reports 100% and what are the workarounds we have used for each issue we faced in the conversion. 1. Company Logo is disappearing after the conversion – Need to re-point / redirect the logo path in the cell format. 2. In footer, objects are not aligned properly – Delete the existing cells, create the cells manually and realign the objects. 3. 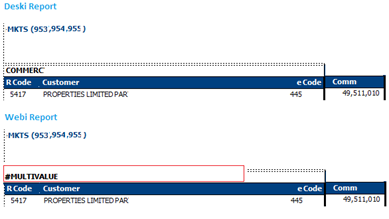 Table borders are displaying as single line instead of double dotted line and there won’t be dotted lines in Webi reports – Change the table border to single dotted line (thick). 4. Date format will be changed in Webi after conversion (mm/DD/YY) – Update the Date format in Webi like mm/DD/YYYY. 5. 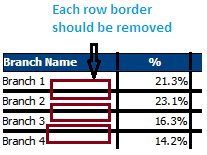 After refreshing the converted Webi report, table is displaying with borders for each row in all the pages – Remove the border for each cell and change the cell format to none for each cell. 6. Report Header and Header borders are not aligned properly – Change the alignment of the cells in the header for proper alignment. 7. All the Converted reports are displaying in “quick display mode” – Change the report display into page mode. 8. Table size is exceeding the page margin (fit to page won’t be available in Webi reports) – Verify in page mode whether the report is fitting in proper page else change the page size appropriately (A4, A3, Letter, etc.). 10. 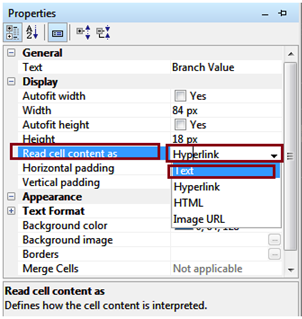 Column headings are not displaying properly in the table header – Un-check the ‘Read content as: HTML’ option in the format Cell Menu. 11. If the column header of the table used Wrap option, those Column headers are not wrapped properly – Adjust the Column width of the Cell to get the proper header in the report header. 12. Legend values are not displaying properly in Graph – Change the Legend position to right of Chart. In Webi Legend values will not be completely visible if it is placed in the bottom of Chart. Only if the Width of Chart is extended to a Very high Range it will display properly but it will change the appearance of chart. 13. After the conversion Titles are added automatically to the Legend – Changed the text color to white to make it Invisible and there is No Option to disable the Title in Legend. 14. Border added to the title of chart & legend in graph – Disable the borders. 15. If your report has some formula / variables to display the Chart Title then it won’t display the Values for Formulas whereas it is displaying as a Text in Webi report -Clear the Title of Chart, Insert a cell inside the Chart, Create a Variable with required Formula for each chart and Change where condition based on the filter of Charts. 16. Filtering the data based on another object facility is not available in Webi report – Create a variable and apply filter for the same variable. 17. Table Level filters are missing in converted Webi reports – Select the tables manually and apply the required filter based on original Deski reports. 18. Number format for Measure (amount column) object set as Standard in Deski report (###0.00) won’t have same format in Webi report for all values. You have to manually set the Number format in Webi to get ###0.00 result in report. 19. 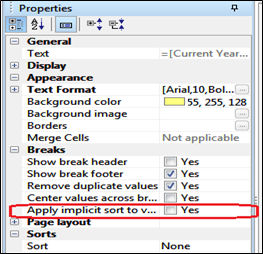 Break wise Sort is not working properly (sort applied based Break is not working) – Select the below option in Break properties and apply sort. 20. After Conversion, Break is removed in some of the Webi reports and you have to re-apply the break in converted Webi report based on Deski report. 21. Break on an object in a table header is not working in WebI – Insert the object in the table by adding a column and minimize the column width. Apply break on this object and enable the break header. Disable the table header. Need to do some formatting changes to display the data properly. 22. Background color got changed (Alternate rows in a table is getting background color whereas there are no background colors in Deski report) – Manually change the Background color for that table in Webi. 23. Cross tab row wise is total (Sum) not having correct values after converting to Webi report. For example, in Deski report has formula as Sum(ForecastAmount- SalesAmount) and that should be changed to (ForecastAmount- SalesAmount) in Webi report. 24. Multicube Deski function changed to ForceMerge function in Webi report. 25. BO Security Domain Deski function to get the BO server / system name is not available in Webi. 26. Empty rows are displaying in WebI report when there is no data for Measure objects (if the report created based on multiple data provider) – Deselect the Display option ‘Show rows with empty measure’ in the Properties. 27. 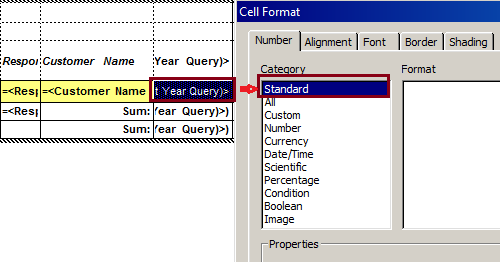 Column names cell is missing in some of Section based Webi reports – Enable the show Table header check box in table properties. 28. Prompt LOV having issue in Webi report – Example, you have one prompt with LOV and that LOV format is Character in DB level and you have defined as Number in BO universe which will work for Deski reports when you click values in the report refresh prompt. Whereas same will give you a below error in Webi report. You have to update / correct the LOV objects in BO universe to have correct object format. 29. If your Deski report has synchronized query in a single Data provider and report created using those synchronized query objects, when you convert that report into Webi, your will break and you will see #CONTEXT & #DATASYNC for all non-common objects between those 2 synchronized queries. 30. 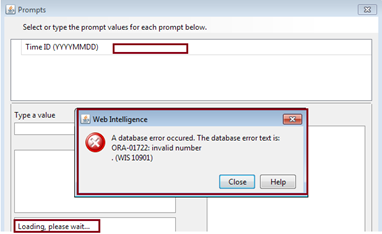 Some report is having “the SQL is not ready” error while refreshing in Webi – Edit the Data provider, remove & add some objects and save & close. Note -1: In general, all complex variables created in Deski report should be revisited and updated in Webi reports based on the requirement to achieve the exact result. Note -2: Overall report refresh (performance) is positive is Webi reports while compared to Deski reports. I have summarized the issues whatever I have faced in my conversion and provided the workaround solutions for the same. Please pass on your comments for better solution. Were you able to fix issue #12? To fix the issue #12, you have to increase graph and make sure the legends are not going out of the page. There is no option to accommodate the legends without increasing the graph size. its very informative..could anyone tell me here how to decrease the refresh time of the reports which takes longer even to schedule? thanks a lot for your response.My project is deski to webi 4.0 upgradation, i dont have the access to universes,and I am a fresher,even scheduling the reports in the back end takes long time,want to restrict the data either in the query level or report level(add filters) or any other way is there?? Hi, you may try applying query level filter to restrict data before you have to clear on what is needed in that report. Another think you remove unwanted objects from report query which will help you to speed up the report refresh. Oh Wow Madesh ,Thanks for replying so soon..I am working on that.let me get back to you once i am done. 2. Check your universe join complexity and fine tune those joins, example don’t use any calculation in where clause conditions. what kind of possible #errors are there during the purge of the webi report and ways to resolve them? Hi, purging the webi report won’t make issue. thing is that in this project we gotta check the purge structure mismatch for the reports in deski and webi 4.0 like if there is extra cells in webi report after purging the report,sometimes i dont have 0 in specific cells in webi wherin we have that in deski..likewise what kind of possible errors are there(#errors during purge mode)? if there is a a mulitvalue error in webi for the respective values in deski,in what ways can we fix? I mean i just applied the min and max function it resolved the error, but the order of the data was not coming properly,I compared the sorting order in deski and webi,made it same..but still could not match the order of the data as displayed in the deski.Any solutions for this……….? I can share the screen shots.. if needed. basically multi-valve error would occur when there is a multiple values for that object.. U can fix that using any of the aggregate functions like min, max.. To match ur requirement u have to see ur report data how it is displaying.. Apply foreach or forall or some in body functions to get ur desire result. wondering if i could share the screen shots with you!! is there any option?? Thanks for your reply let me try the solution and get back to you.Any idea on how to the error:”Requested Server name not found..(IES 10901)”while refreshing in the webi 4.0 for sybase reports”?? could you tell us how to deal with the custom sql(free hand sql reports) and macros report as well. Create derived table in universe using that free hand SQL and create the webi report based on that derived table. The information you sharing so valuable. Thank-you so much. I’ve done MCA -2011, and I’ve learned Businesses Objects and looking for job suggest me please. Could you provide and solution for this??? In response to the above query i got the solution.Thanks a lot. Hi, #datasync error will occur when these is an merge dimensions used in report from multiple DP. You can try converting the dimension objects into detail to get the desired result. We cannot say which one to convert as detail but u try the dimensions into detail objects.. That’s how we have achieved for our reports. are not gettting displayed for many reports.Any solution for this? During download no error was displayed,but while running the exe file its displaying “End of archive” and some component related to SAP mobile services was missing.Could you please let me know any other site,or i have to try redownload the software.I got to download the webi,UDT,IDT.Please help me on this. Hi, you can download only from SAP site and u can try to re-download an install. I faced an issue regarding the alerts and conditional formatting while converting the deki to webi.In deski report for a block suppose there are 10rows and the user wants to show the specific rows into blod and negative values has to show in the red with brackets,so in deski they have kept an alert for displaying bold and formatted the cell to display as red with brackets for less than 0 values.While conversion into webi by using RCT the negative values are showing without red but with brackets so it leads to an wrong output as it was showing as positive value. Hi Bharath, sometime after conversion alert won’t perform as like deski, please try to create all the alert from scratch in webi and try to apply the same. Hi, yes, you can create 2 alert. One is for format and another is for BOLD & Red.